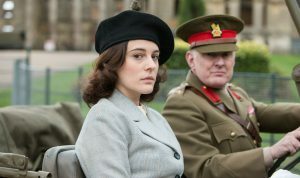 Set in the aftermath of the Second World War, Close To The Enemy tells the story of Captain Callum Ferguson (Jim Sturgess), an intelligence officer who is given the task of recruiting captured German scientist Dieter (August Diehl), to work for the RAF on the development of the jet engine by the British army. The seven part series is written and directed by Stephen Poliakoff (Dancing on the Edge, The Lost Prince) and stars Jim Sturgess (Deception, Spike Island), August Diehl (Le jeune Karl Marx, Come What May), Freddie Highmore (Bates Motel, The Journey), Charlotte Riley (In the Heart of the Sea, Edge of Tomorrow), Phoebe Fox (The Hollow Crown, The Woman in Black 2: Angel of Death) and Alfred Molina (Spider-Man 2, Love is Strange). The Close To The Enemy production team chose to film at The Historic Dockyard Chatham on HMS Cavalier, inside and outside Slip 3 and the upper floors of the Ropery which doubled as the arrival halls at the docks. They also used a drone to fly across the river where the boat arrives. The Historic Dockyard Chatham is set over 80 acres and contains over 100 Georgian and Victorian buildings as well as cobbled streets and dock spaces. Previously filmed at The Historic Dockyard Chatham was Call the Midwife (2010 – 2016), Downton Abbey (2013) and The Golden Compass (2007) among others. Close To The Enemy starts on Thursday 10th November 2016 at 21:00 on BBC Two. 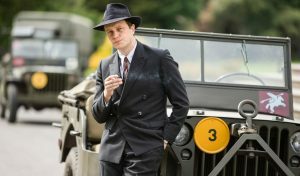 This entry was posted in Filmed in Kent and tagged Close To The Enemy film locations, Stephen Poliakoff, The Historic Dockyard Chatham, TV Drama. Bookmark the permalink.